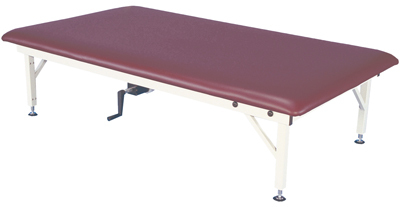 Bariatric Hi-Low tables with firm density foam available in various color options. 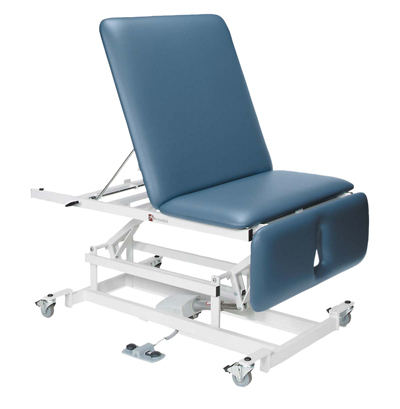 Bariatric 3-section Hi-Low table with castors. 34 ounce heavy duty vinyl with Permablock 3 bacterial protection. 1-3/4" firm density foam top. Footswitch control. 76" L x 36" W x 22-38"H. Head section: 15x36" raises 45 degrees, lowers 90 degrees and has contoured face/nose opening. Opening center section 22x3" does not raise. Foot section 39x36" raises to 70 degrees. 800 lb. weight capacity. Firm density foam available in various color options. Dimensions: 76" x 22-38" x 36"
Bariatric mat platform table is welded with an all steel frame. Electric model features 120 volts, 60 Hz motor. 2" firm density foam mat. Height adjustable: 20" - 30". 900 lb. weight capacity. Firm density foam available in various color options. Dimensions: 48" x 20-30" x 84"
Bariatric mat platform table is welded with an all steel frame. Hand crank 20" - 30" in height. 2" firm density foam mat. Height adjustable: 20" - 30". 900 lb. weight capacity. Firm density foam available in various color options.